Charleston County's Environmental Management Department operates the Bees Ferry Road Landfill, a 312-acre site with designated areas for solid waste and debris brought in by local municipalities. 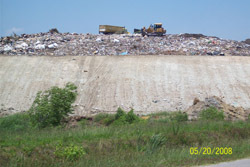 As of July 1, 2008, the Bees Ferry Landfill no longer accepts construction and demolition, vegetative waste or yard debris from private or commercial haulers. Tires may still be delivered for $90 per ton, metal for $30 per ton and municipal solid waste for $66 per ton. What Can Residents Bring To The Landfill? Charleston county residents can dispose of one load, up to a ton, of construction and demolition, vegetative waste or yard debris per month at no charge with proper proof of residency. Simply drive up to the white scale house to check in with the attendant. For questions about what you can dispose of at the landfill, contact the Environmental Management Department at (843)571-0929. Where Can I Take Household Garbage If I Don't Have Residential Pick-up? The Charleston County Environmental Management Department does not collect garbage. Garbage pick-up is managed by the various municipalities and public service districts (PSD) throughout the county.